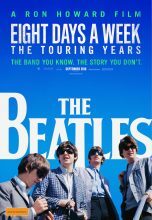 The Beatles new movie Eight Days A Week from director Ron Howard is an incredible document of the touring years. The Beatles gives fans an incredible insight to the madness that the world of The Beatles quickly became. Remember the 60s was a time before audio technology had developed. This band was put in front of up to 55,000 fans at a time with an inadequate audio system. Stadium shows were played through a PA. The noise from the crowd drowned out the sound of the band. The band could not hear each other and eventually the circus took over and John, Paul, George and Ringo lost interest in live performance. By 1966, The Beatles stopped touring. They only performed in public one more time, in 1969 on the Apple Rooftop, as seen in the Let It Be movie and in Eight Days A Week. The story Ron Howard does not go into was the death of Beatles manager Brian Epstein. Brian held the band together, without him, over the next four years, the band members shifted apart. When I interviewed George Harrison in 1992 I asked him if he was disappointed that The Beatles stopped touring. “Not really,” he responded. “I was disappointed retrospectively. I was disappointed that we got so famous, because as musicians, we were a really good band in the early days. And the more fame that we got, the more the audience screamed and the more that we did just 20 or 30-minute shows of our latest singles. The musicianship kind of went out the window. And when I hang out with somebody like Eric Clapton, who, on the other hand never stopped touring and never got into that situation, he always just changed bands, he really became so fluent on his instrument. You know, we pigeonholed ourselves by the mania that was going on and the inability to perform for longer periods at a time, because of the way it was”. The positive that came out of The Beatles stopping live performance was the rapid evolution of the sound. George added, “If we’d have kept touring, we might not have gone into the studio to do those kinds of intricate works (Sgt Pepper/Abbey Road). But the last tour we did, I remember trying to do “Paperback Writer”, which had a kind of double-tracked vocal and all that stuff, and it was a bit embarrassing at the time. I remember, “This isn’t making it. This doesn’t sound very good.” So I don’t know, but the Beatle tours were something else. You would have had to have been there to know how ridiculous it was. There was no way we could have continued under those circumstances”. It perhaps seems impossible that any images of the Beatles remain unseen, but this fascinating book accompanied by a DVD of rare 8mm footage provides a whole new insight into the Beatles, in pictures. the over 200 images include several early photos of the Quarrymen – when John first met Paul; the filming of A Hard Day’s Night at Paddington; the Beatles in the Bahamas in 1965 filming Help; John and Yoko at home; and Paul on holiday in Frank Sinatra’s Learjet…plus many more! Encapsulating the culture, music and spirit of the ’60s, this unique book brings us closer to one of the world’s all-time favourite bands and is sure to delight any fan. While it could be said the the pictures ‘speak for themselves’, interviews with many of the photographers give us an extraordinary insight into the background of each shot, while extended captions give further behind-the-scenes information to complete this fascinating package. Noise11 has five copies of ‘The Beatles: On Camera, Off Guard’ plus a double in-season pass to see the movie for Noise11 music newsletter subscribers. The Ron Howard Beatles documentary ‘The Beatles Eight Days A Week’ will be released on DVD and Blu-Ray on 18 November and while it will be chockers with bonus material the controversial Shea Stadium concert will not be included. Less than a week after the premiere of Ron Howard's new documentary The Beatles: Eight Days a Week - The Touring Years, it has been announced that the film will be released on DVD and Blu-Ray on November 18. If the company Syd Bernstein Presents the Shea Stadium concert at the end of The Beatles Eight Days A Week movie may disappear fast. The Beatles historic Shea Stadium concert from 1965 will screen in cinemas with the new Ron Howard documentary ‘Eight Days A Week’. Academy Award-winner Ron Howard’s authorized documentary feature film about The Beatles’ phenomenal early career, The Beatles: Eight Days A Week - The Touring Years, has set its World Premiere Date in London’s Leicester Square on September 15.